What should be the mix proportions of antifreeze concrete admixture during freezing conditions and also suitable antifreeze to be used. 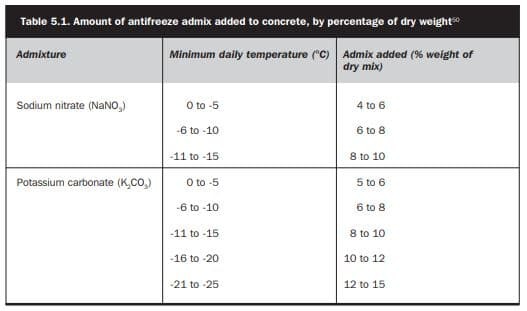 The mixing ratio of the concrete or the mortar, and the amount of the admixture to be used must be defined with the laboratory trials, using the raw materials taken from the construction site, depending on the required concrete class and the quality, and ambient temperature, Table below provide a percentage of the weight of the dry concrete mixture. Strength of bricks made from red mud+B-Sand/ G-Sand+Cement? Which cement is best for concrete slab construction? OPC or PPC? What are the types of slabs and how to design them? Which Type of Chemical Cleaner used for Efflorescence Removal?